It’s best to be careful when driving along country roads - and particularly if those roads are in Mooresville, Indiana. One could encounter any number of creatures or farm equipment on a typical country lane, but in Mooresville, you’re also likely to encounter basketballs, cars parked in neutral and maybe even a few curious pedestrians holding bags of flour - all at the bottom of one captivating hill which seems to be pulling everything upward, against gravity. 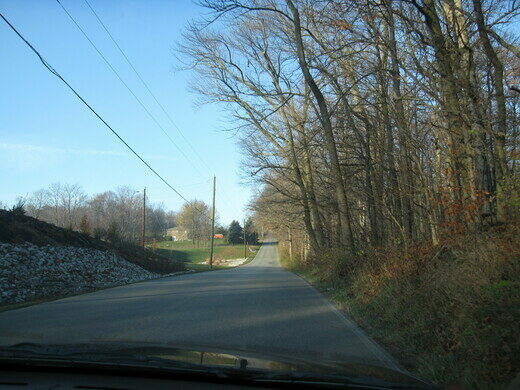 Mooresville’s famous Gravity Hill (near Magnetic Acres) is an optical illusion, but it is a convincing one. If one were to put their car in neutral at the “bottom” of the hill (or place a ball in the road, for the safety-conscious), the hill will immediately start to pull it “up” - in the wrong direction, according to our old friend gravity. Legend has it that a school bus stalled at the bottom of this hill decades ago when it intersected with a railroad track, then was struck by an oncoming train, killing several riders. Nowadays, the locals will tell you that it’s the spirits of the children on that bus that push things uphill and out of harm’s way. They’ll even instruct you to sprinkle some flour on your bumper - in which the children’s fingerprints supposedly appear after you’ve been pushed to safety. Take exit 59 off of I-70 to Highway 39, then turn left on Keller Hill Road. Take the road to the dead end, then turn around. One mile after turning around, you will find the hill. One of the largest collections of merchandise from the famous British sci-fi show can be found smack in the middle of Indiana. A 30-year-old Sycamore tree grown from a seed taken to the moon and back. A mysterious spot where the laws of gravity seem not to apply.